This short trick film from Georges Méliès deals with magical dismemberment, animated body parts, and the danger of one’s own body parts going into revolt. Of course, it’s all handled in a light-hearted fun way that keeps with Méliès’s child-friendly spirit, but I’m still including it with my history of horror as a movie that may have inspired darker visions at a later date. 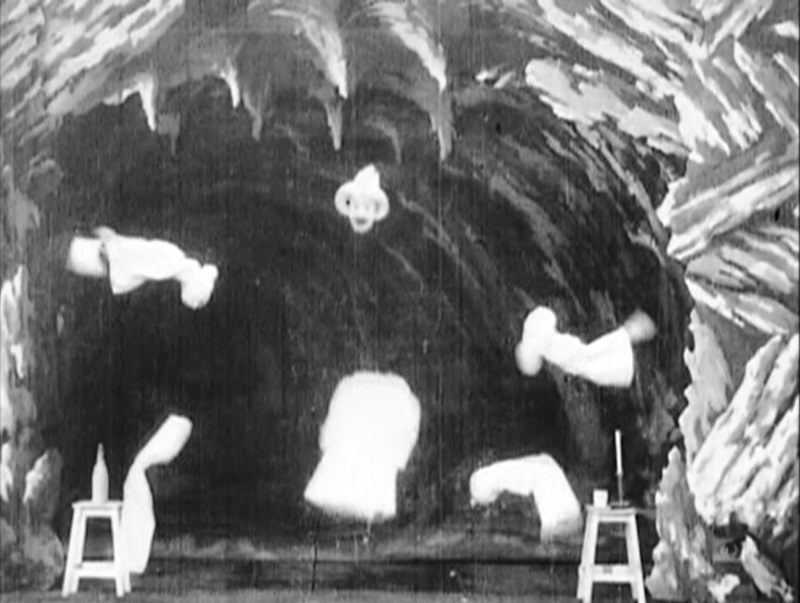 A man dressed as Pierrot walks onto a proscenium-style set painted to represent a cave, with a few stools set at a distance from one another. He sits on the middle stool, then looks over to see a bottle of wine to stage left. He reaches for it, but, as it is too far, he detaches his arm, which now floats over to the bottle and picks it up, floating back across the stage to re-join his shoulder. He then sends his other arm to retrieve the glass sitting on the other stool, and pours himself a glass of wine. Next, he takes out a pipe and puts it in his mouth, but the candle is on the second stool, so this time he detaches his head and it floats over to light the pipe from the candle. Now, he tries to cross his legs, but they are uncomfortable, so one detaches itself and floats to the right stool, the other to the left. His legless torso now drops painfully to the ground. He gets his rebellious legs to reattach themselves, and then does a dance which culminates in his complete dismemberment as all of his limbs and his head detach themselves from the torso, with all six pieces dancing on their own. Finally, the body is rejoined, and he takes off his own head and sits on it before bowing, tucking the head under his arm, and exiting the stage. The original Star Films catalog refers to this as “one of the best and most mysterious films ever produced,” which seems to justify the sense that it might count as a horror film. It claims that “there [is] not the slightest doubt that they are genuine living limbs,” although for the final dance, most of the limbs do look like props on strings, except for the head. Nevertheless, a lot of work went into making these effects in-camera and getting the timing and positions right must have been quite difficult. Imdb claims that this movie stars Méliès himself, but I’m not certain – the Pierrot figure doesn’t have his signature beard, and I feel like he moves a bit differently from Méliès. At any rate, whether or not it is “absolutely unique” as the catalog claims, it is a fun example of what Méliès learned to do in a few short years as a filmmaker. Watched this 2x in a row. I love it when Méliès shows off.